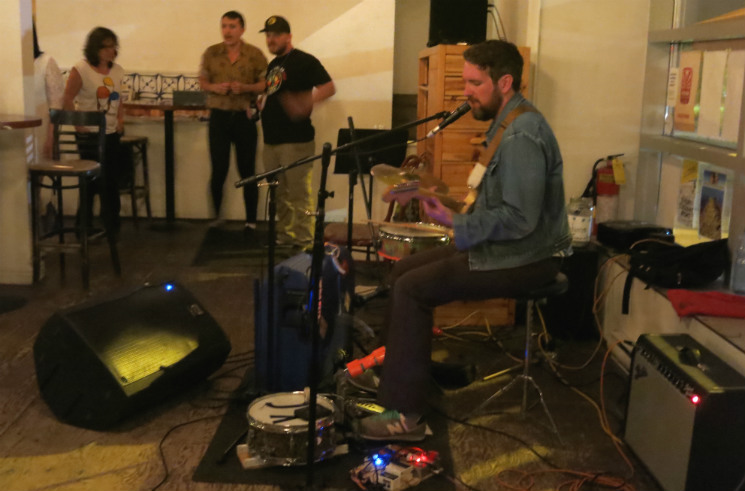 Loose and silly, ramshackle and ragged, Shotgun Jimmie's music is a great way to unwind after a long day of festival-going. Playing to a cozy room at the Fromagerie as the second of a two-artist bill of one-person bands (following Rae Spoon), Jimmie charmed the crowd with his Ramones-ish songs about sleeping on couches, an Attack in Black cover, and some priceless choruses (like, "I hope it's not too fast to ask you to move to Alaska"). The Fromagerie turned out to be an ideal venue for him: "I've got my heart on my sleeve and cheese all over my cheek," he said. His enthusiasm was evident on "Join the Band" off Field of Trampolines, his ability to go with the flow evidenced by his mid-song realization that he was in a different key than he was supposed to be for "I Will Climb Mountains," off 2013's Everything, Everything. "I'm blowing my own mind right now, harmonizing," he joked. Like a slacker-rock Leonard Cohen, Jimmie delivered some absurd wisdom: "Life is impossible but it's also a popsicle," he sang. He also poked fun at usual folk fest fare ("I'm gonna sing a song about motorcycles and desserts … just kidding," he said) and spelled out "Bioluminescence" in a song. Somehow, Jimmie managed to remain on the verge of a musical collapse, in the best possible way.